(272 x 395 mm) 11.7 x 16.5 in. In 1989 I was commissioned by the publishing editor of Penguin Arkana to make this painting as a cover for Namkhai Norbu’s forthcoming book, "Dzogchen, The Self Perfected State". The syllable A is the primordial vowel sound of both the Sanskrit and Tibetan alphabets, which as a bija or ‘seed syllable’ underlies the ‘rosary of speech’ as mantra. The three syllables OM (white), AH (red), and HUM (blue), respectively symbolize the three aspects of Enlightened Body, Speech, and Mind, which correspond to the crown, throat and heart centres, and these three Tibetan syllables are traditionally inscribed on these three psychic centres upon the blank back surface of deity thangkas. The Enlightened Qualities and Activities of the deity are also represented by the syllables SO and HA in their respective navel and sexual centres. 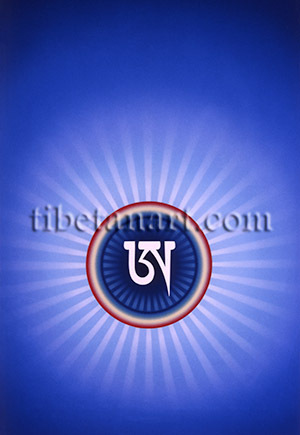 Within the ‘Great Perfection’ practices of Dzogchen or Ati-Yoga the white Tibetan syllable A (pronounced as a long aspirant 'AH'), is widely visualized within a luminous sphere (Tib. thig-le) of rainbow light. In the practice of awakening to the ‘natural light’ of dreams a white syllable AH is visualized and held at the centre of one’s body or throat during the process of consciously passing from the waking state into sleep. A series of spontaneously-arisen AH syllables may also be visualized as creating an interlinked chain of AH syllables, which are said to deepen the state of clarity and lucid awareness in the dream state. In the Dzogchen tradition the syllable A is essentially a symbol of the fully awakened or ‘natural state’ of mind; and among the various length versions of texts of the Prajnaparamita-sutras, the syllable A is said to represent the ultimate essence of all the ‘Perfection of Wisdom’ teachings.